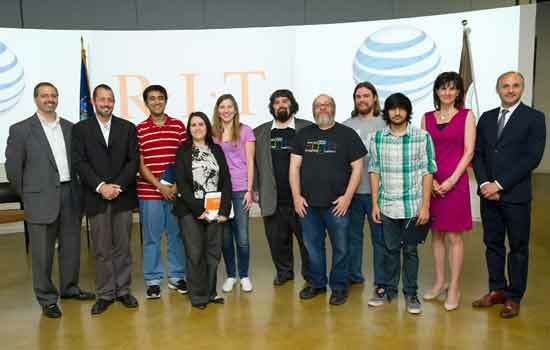 RIT students and staff had a strong showing in the 2014 AT&amp;T Rochester Civic App Challenge. Pictured after a May 13 news conference announcing the winners at the Center for Media, Arts, Games, Creativity and Innovation are High Tech Rochester President Jim Senall, RIT MAGIC Center Director Andrew Phelps, graduate student and third-place winner Debjit Saha, senior research analyst and honorable mention winner Nilay Yildirim, graduate student and grand prize winner Marissa McDowell, MAGIC Open Source Resource Coordinator Remy DeCausemaker, Professor Stephen Jacobs, Sam Lucidi, student Mihir Singh, Digital Rochester Executive Director Lisa Doerner and AT&amp;T Public Affairs Director for New York State Neil Giacobbi. The challenge, hosted by RIT, was sponsored by AT&amp;T in partnership with High Tech Rochester, Digital Rochester and Hack Upstate. Four Rochester Institute of Technology students, four alumni and one staff member were among the winners of the 2014 AT&T Rochester Civic App Challenge. AT&T and its challenge partners – RIT, Digital Rochester, High Tech Rochester and Hack Upstate – on May 13 announced the winners of the challenge, a two-month “virtual hackathon” in which developers leveraged open data to build smartphone apps that serve community needs. RIT hosted the challenge. The winners – chosen from among 23 entries – were announced at a ceremony at RIT Center for Media, Arts, Games, Innovation and Creativity (MAGIC), after which developers demonstrated their winning apps. First, second and third place, as well as honorable mentions, were given in two categories – apps created specifically for the challenges and those that were already under development before the challenge was launched. Nilay Yildram, a senior research analyst at RIT, whose College Locator app, created with partner Gregory Sapio of Syracuse, also received an honorable mention and $500. The app provides information on New York state colleges, including institutional profiles, available scholarships, financial aid and cost details. Mihir Singh, a first-year student in multidisciplinary studies from Vancouver, British Columbia, and Mike Nolan, a third-year student in new media interactive development from Fairport, N.Y., who received an honorable mention for RHoK the Hood, which provides concise versions of information frequently requested through Freedom of Information law. Challenge organizers said they were pleased with the participation and look forward to sharing the apps with the greater community. Winners were chosen by a panel of judges, who based their decisions upon the apps’ potential impact on Greater Rochester, execution and creativity or novelty.